The story of The Giver centers on Jonas (Brenton Thwaites), a young man who lives in a seemingly ideal, if colorless, world of conformity and contentment. Yet as he begins to spend time with The Giver (Jeff Bridges), who is the sole keeper of all the community’s memories, Jonas quickly begins to discover the dark and deadly truths of his community’s secret past. With this newfound power of knowledge, he realizes that the stakes are higher than imagined – a matter of life and death for himself and those he loves most. At extreme odds, Jonas knows that he must escape their world to protect them all – a challenge that no one has ever succeeded at before. The Giver is based on Lois Lowry’s beloved young adult novel of the same name, which was the winner of the 1994 Newbery Medal and has sold over 12 million copies worldwide. “The Giver” is an intriguing tale of a society that has chosen to ignore memories and emotions in order to suppress negative thoughts, jealousy, violence, romance and faith. The story begins “after the ruin” and we are exposed to a world without grief, color or independent thinking. Conformity is the rule and teenagers are assigned jobs based upon their skills. One young man named Jonas is chosen to be “The Receiver” of memories and is introduced to his new mentor “The Giver” who currently safeguards these experiences. When Jonas is exposed to a full range of emotions and violence of past humankind, it awakens in him a desire to break the chains of oppression by sharing these newfound feelings with everyone else. The movie is a powerful testament to the gifts of individuality, emotion and faith. The story is told in a straightforward manner and will keep the audience’s attention throughout. Rarely do we see films these days that are sensitive to the desires of viewers who want to experience an uplifting film without senseless language or overly graphic violence. “The Giver” delivers a wholesome experience and we are pleased to award it our Dove “Family-Approved” Seal for ages 12 and over. 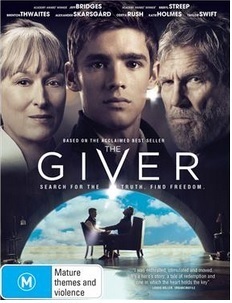 via The Giver | Find Top Family Movies | Dove Family Friendly Movie Reviews. The Giver was a very good movie!